The deer can be conquered and you can have a lush interesting garden that will not be eaten. The following are outstanding shrubs that continue to be deer resistant in our area. 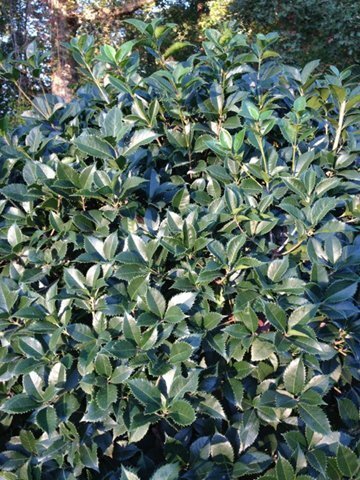 Winter Daphne (Daphne odora) is a dense 3 feet tall and wide evergreen shrub covered with fragrant flowers in late winter. 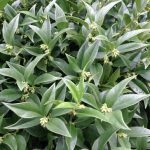 ‘Ripple’ is a new introduction by nurseryman Sam Allen of Clayton, NC, and is an exciting new twist on the traditional variegated winter daphne. 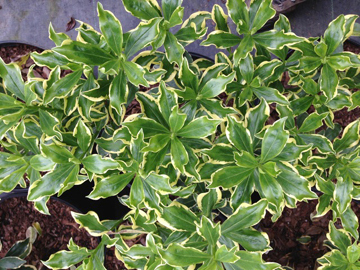 The foliage is striking with a wide creamy edge and a distinctive undulation along the margin of each leaf. With all daphne, it is important to provide good drainage and avoid over watering. Oriental Sweetbox (Sarcococca orientalis) proved last winter to be the most cold hardy shrub sweetbox in the garden. 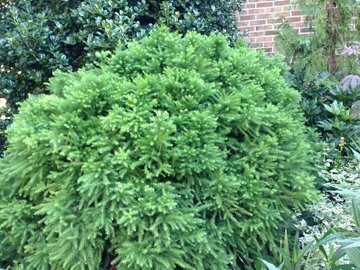 Reaching 3 to 4 feet tall and wide, this evergreen is great for dry deep shade or any part sun location. In winter, Oriental sweetbox is covered with tiny fragrant white flowers that will greet you on a cold day. 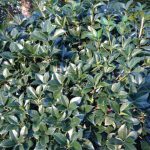 This dense shrub is drought tolerant and creates graceful structure in the garden. 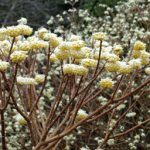 Paperbush (Edgeworthia chrysantha) is a fabulous deciduous shrub that draws attention in the garden all year long. 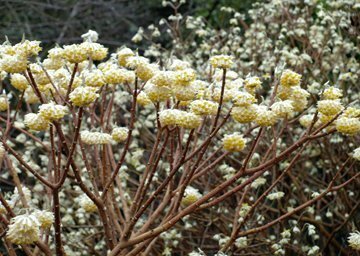 Beginning in late winter this large plant is covered with fragrant clusters of creamy yellow flowers that are perched atop the interesting branch structure. In spring the lush blue-green foliage covers the plant, creating a dramatic tropical accent in morning or filtered sun. ‘Snow Cream’ is a fantastic introduction by Tony Avent of Plant Delights Nursery in Raleigh, NC. 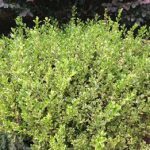 Boxwood (Buxus microphylla) performs well in most garden conditions. 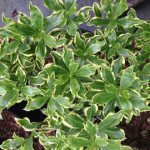 ‘Golden Dream’ is a beautiful variegated boxwood that can be sheared in the formal garden or kept looser in the mixed border with perennials and grasses. The small green leaves with a slight yellow margin brighten any location in both sun and shade. This 3 feet tall and wide shrub is great as a foundation plant or as an accent in the mixed border. Try it in a container this winter with pansies. 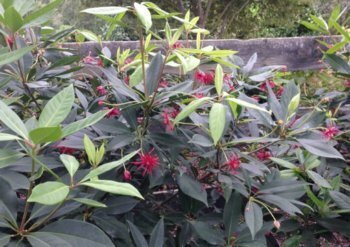 Hybrid Anise (Illicium) ‘Ruby Stars’ is a new anise shrub with the biggest and brightest red flowers that we have seen on any anise. 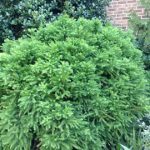 This easy to grow broadleaf evergreen reaches 5 to 6 feet tall and blooms in both spring and fall. ‘Ruby Stars’, along with the white flowered ‘Ivory Stars’, are recent introductions from the breeding work of Sam Allen of Clayton, NC. These wonderful shrubs are a great accent in the shade garden and useful in mass where they get filtered sun. 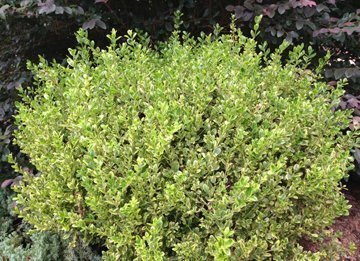 Osmanthus is a tough drought tolerant large shrub that is well suited for full sun to part shade. 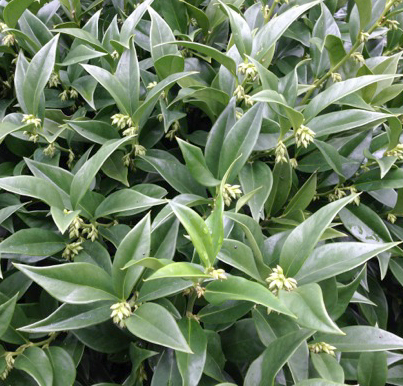 Osmanthus ‘Carl Wheeler’ is an 8 feet tall by 6 feet wide evergreen covered with sweet fragrant flowers in October that will permeate your whole garden. The handsome rounded foliage has a distinctive small, serrated edge that resembles a Venus flytrap. 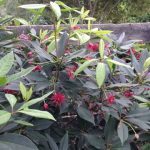 Try this elegant shrub as a large accent or for screening. 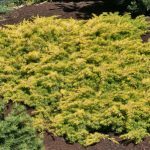 Shore Juniper (Juniperus conferta) ‘All Gold’ continues to be our favorite low juniper in the garden. This fast growing conifer with bright yellow foliage reaches 1 foot tall and 4 feet wide in three years. This colorful groundcover combines well with many shrubs and truly makes the garden more interesting. Japanese Cedar (Cryptomeria japonica) ‘Elegans Nana’ is a versatile and beautiful conifer that offers a distinctive bright green texture in both sun and part sun. 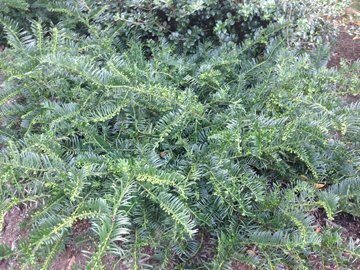 This slow growing 4 feet tall and wide evergreen creates dense yet irregular form in the garden. ‘Elegans Nana’ is great as a specimen or as a structure plant repeated in the mixed border. 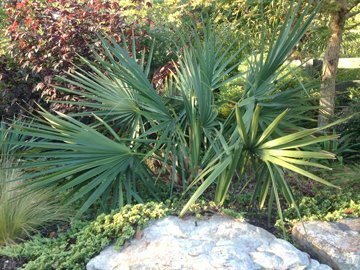 Dwarf Palmetto (Sabal minor) is an underused native palm that has a tropical presence in both sun and shade gardens. The foliage grows from the base creating a dense 8 feet tall clump that looks great all year. It can be planted in mass for a dramatic effect, which resembles its appearance along the North Carolina coastal plain. In summer, tall spikes appear that support large panicles of white flowers. 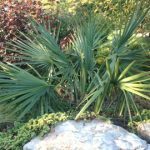 Dwarf Palmetto is a bold plant that always draws attention. 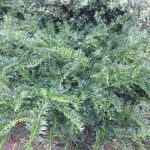 Plum Yew (Cephalotaxus harringtonia) ‘Fritz Huber’ is the most versatile low growing plum yew. 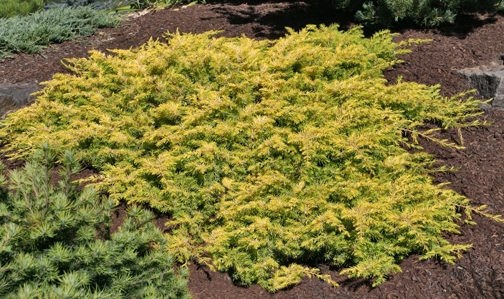 This spreading conifer with soft, dark green needles is well suited for dry shade to almost full sun conditions. Reaching 2 to 3 feet tall and 5 to 6 feet wide, it is useful in mass or as an accent in the mixed border. ‘Fritz Huber’ looks great in the garden with ‘Goshiki’ Osmanthus and Arborvitae fern. Photos except Paperbush courtesy of The Unique Plant.